Read our key findings here and download the full special report PDF below. The outlook on the economy and job availability is less positive among alumni than rural Minnesotans as a whole. Economic development is the leading concern among the alumni population, with 16 percent identifying this issue as the most critical in their community. Nearly a quarter (22%) of alumni feel their community economy is somewhat worse compared to a year ago. While just over one-third (36%) of rural respondents feel their community does not offer an adequate number of jobs that pay household-supporting wages, over half (55%) of alumni feel this way. Although the percentage of alumni who feel their community offers an adequate number of jobs that pay household- supporting wages (43%) is below the overall rural population (60%), it is steadily improving over previous studies. Four out of 10 (40%) alumni do not feel their community successfully maintains and grows job opportunities. About half (51%) of alumni disagree that their community possesses an adequate workforce for businesses. This is nearly double the percentage of rural residents (27%) that feel the same. Program leadership alumni recognize their community’s need to improve working cohesively but are confident in their personal ability to impact change. More than nine in 10 (94%) alumni are confident in their ability to personally make a positive impact in their community. This is 10 percentage points higher than rural residents who feel the same. Roughly one-fifth (19%) of alumni do not agree that their community works together effectively across differences such as sexual orientation or race. However, there has been a steady improvement from previous studies. Alumni are not as satisfied as the rest of rural Minnesotans with their community’s performance on a variety of issues. Eighty-six percent of alumni feel their community does a good job at controlling crime, equivalent to the percentage of rural residents who agree. More alumni (86%) gave their community a good rating in regard to healthcare than the overall rural population (79%). Housing issues are considered much more of a concern among alumni than rural Minnesotans overall. While 68 percent of rural residents feel their community is addressing this issue appropriately, less than half (45%) of alumni agree. Nearly two-thirds (63%) of rural residents rate their community positively regarding the availability of childcare, yet only 41 percent of alumni respondents feel the same. Sixty-one percent of alumni feel their community offers accessible public transportation for all, compared to 72 percent of rural residents at large. Communities are not meeting alumni expectations in a number of areas including childcare, affordable housing, workforce adequacy, economic development, mental health, jobs opportunities and opioids and drug abuse. Alumni are concerned about their representation. Nearly two-thirds (64%) of alumni feel the needs of their rural communities are not as important to legislators and policymakers as those of the metro areas. This is considerably higher than the percentage of rural residents overall who feel the same (38%). Only 30 percent of alumni feel their community’s needs are equally as important to elected officials as the metro area. This is down from 35 percent in 2016. 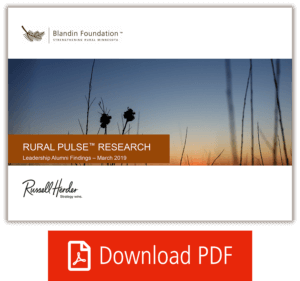 Rural Minnesotans are more inclusive and confident than alumni in their community’s ability to address diversity and inclusion. Nearly two-thirds (64%) of alumni indicate they have few or no friends of a different race or culture than themselves. About half (51%) identify transgender people as the group experiencing the most discrimination within their community. Alumni are less confident in their community’s ability to stand up to hatred and discrimination, with only six in 10 (60%) feeling such is the case. This is more than 20 percentage points below rural residents overall (82%). Less than half (48%) of alumni feel their community does a good job addressing barriers to inclusion, while seven in 10 (71%) rural Minnesotans feel this way. Though many alumni feel leadership positions in their community lack diversity, the majority have served in a role themselves. Only 38 percent of alumni respondents believe that leadership in their community is comprised of people from diverse backgrounds. This is an increase of eight percentage points from 2016 findings but still remains significantly lower than rural Minnesotans overall (54%). The majority (96%) of alumni have served in a leadership role within their community. Of the four percent of alumni who have not served in a leadership role, nearly all (93%) said they would consider doing so if asked. Alumni are more likely to consider moving to a larger metro area than rural Minnesotans. Just over three-fourths (77%) of alumni indicated that they expect to live in the same community five years from now. One in five (21%) alumni have considered moving to a larger metro area within the past two years. This is seven percentage points higher than the rural population at large (14%). Of those considering a move, about four in 10 (39%) state the reason would be to improve their quality of life. This is a significant difference from rural residents, with only 22 percent identifying the same reason. Download the Leadership Alumni Findings special report PDF for full details.